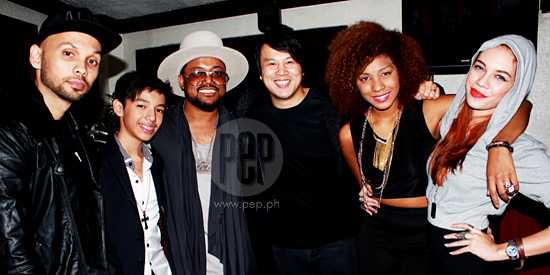 Apl.de.Ap (wearing white hat) is joined by his BMBX artists (L-R) Kevin Lester A.K.A. The Lion City Boy, Miguel Antonio, Thanh Bui, Jessica Reynoso, and Shae. Among all of the singers mentored by Apl.de.ap during the first season of The Voice of the Philippines, 17-year-old Jessica Reynoso is the only one signed under Apl's new record label BMBX (pronounced as Boombox). The Black Eyed Peas' member cites the reasons why Jessica stood out from other singers from Team Apl. “She’s very talented. Of course, first and foremost, it’s her voice, and maybe her look. “She has that international look. She’s like our Pinay Beyoncé, she’s like the Alicia Keys of our Pinas,” he says. Jessica's single and music videos will be released around November or December this year. “It’s about giving people chances, and really, for me, I guess this shows how a father feels like. “I feel like a proud father,” says the Fil-Am rapper whose real name is Allan Pineda Lindo. JESSICA REYNOSO. As for Jessica, she believes that Coach Apl might have also seen her heart for her craft, which could be the reason why he kept an eye on her. “Siguro yung puso pag kumakanta and we have the same story, siguro na-realize niya na parehas kami ng pinagdaanan. “Like we had some struggles in life, some obstacles, pero hindi yun naging dahilan para itigil namin yung dreams namin,” says the singer who is half-Filipino, half-African-American. Jessica is also overjoyed by the fact that she’s working with someone as talented as apl.de.ap, “Sobrang happy, sobrang blessed din kasi nakaka-work ko siya. And hindi lahat ng tao nabibigyan ng ganung opportunity. When asked about her musical influences, the young singer cites Beyoncé, Amy Winehouse, and Christina Aguilera as some of her inspirations. BMBX. Jessica, who now goes by the name JR, will be joining four other international artists in apl.de.ap’s record label. She will be working with 13-year-old singer-pianist Miguel Antonio, Indonesian singer Shae, Singaporean rapper and hip-hop artist Kevin Lester, and The Voice of Vietnam’s coach Thanh Bui. The Filipino-American artist enthusiastically shares his vision, “It’s gonna be Pinoy and Southeast Asia, and of course, we want to reach worldwide. But we have to start here first. And then we go worldwide. “I would also like to do a BMBX concert in the future. But we have to take little steps, right now we have to release songs, and videos, and albums, and make the movement. Coming from humble beginnings and finally reaching this point in his life, apl.de.ap never forgets to be thankful for all the blessings that come his way. “Always got to thank God for making it happen. Because you know, sometimes we release the energy out there, ‘I wanna do this, I wanna do that,’ then you work hard at it.